I totally love baking cookies year round, but there is something special and magical about baking cookies for Christmas. Happy childhood memories of holiday baking with my mom and sister, and visions of the cookie feasts that my aunts presented to their guests, flood my soul and warm my heart. 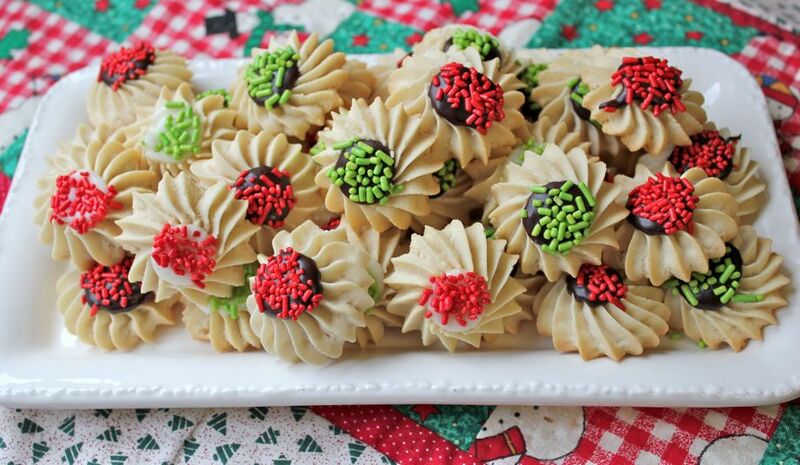 I always try to add a few new recipes to the mix of my tried-and-true Christmas cookie classics, and this year I chose Old Fashioned Bakery Italian Butter Spritz…a recipe from the Woodland Bakery Blog, where you’ll find many scrumptious recipes and helpful tips for baking professional-style desserts. I followed the recipe and directions as suggested*, and got delicious results. These cookies have a firm crumb with a light almond flavor and just the right amount of sweetness. After baking and cooling, I piped on a dot of chocolate ganache, or a dot of vanilla glaze made with confectioner’s sugar, milk and a wee bit of almond extract. Yum! *I did not have the recommended #826 star tip, so I used #867…just as pretty!